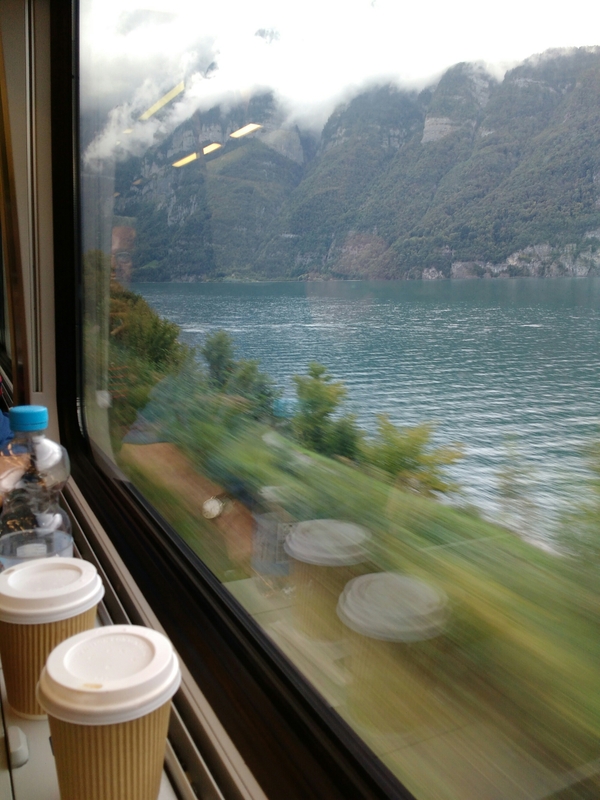 “I’ve just found a blog about this old couple who went interrailing,” I say. Which is handy for you, dear reader, otherwise you’d have to wait while ActorLaddie takes off his soup-stirring glasses and finds his blog-reading glasses. Instead, you can learn at once that I’d been reading about this retired couple who, like us, wanted to explore Europe so got themselves Interrail passes and Eurostarred it across the Channel. Each morning they would take themselves off to their local station and get the first train to wherever it was going, as the whimsy took them. A couple of hours later, they’d get off the train, find themselves somewhere to stay and then start exploring. When the Delights of PrettyTownByDerBahnhof they’d exhausted, they repeated the exercise. They wrote so persuasively about the joys of winging it around Europe, that we thought we’d give it a shot. There are a variety of interrail passes, depending on how long you want to be away and how many of those days you intend to travel. We opted for a fifteen day pass which allowed travel everyday, should one so wish. We blocked out seventeen days in early September – Lille and back on Eurostar and fifteen days between. Then we pushed the dates back a fortnight because they clashed with Helen Archer’s trial. Eurostar tickets bought, Inter-rail passes ordered. I answered questions about holiday plans with an airy “oh, we’re travelling around Europe,” which sounded impressively free-spirited. My second thoughts about not booking anything took root when I had that bout of tonsillitis at camp and we needed to find a bed and breakfast for the night. We spent about half an hour phoning various places in Dorset before tracking down something suitable and it was pretty pricey. I suddenly had a picture of us freshly arrived in, say, Vienna with nowhere to stay and realised that it had the potential to be rather expensive. Perhaps that couple in the blog had much deeper pockets than ours. And would I really be able to relax knowing we still had to find accommodation at every stop? 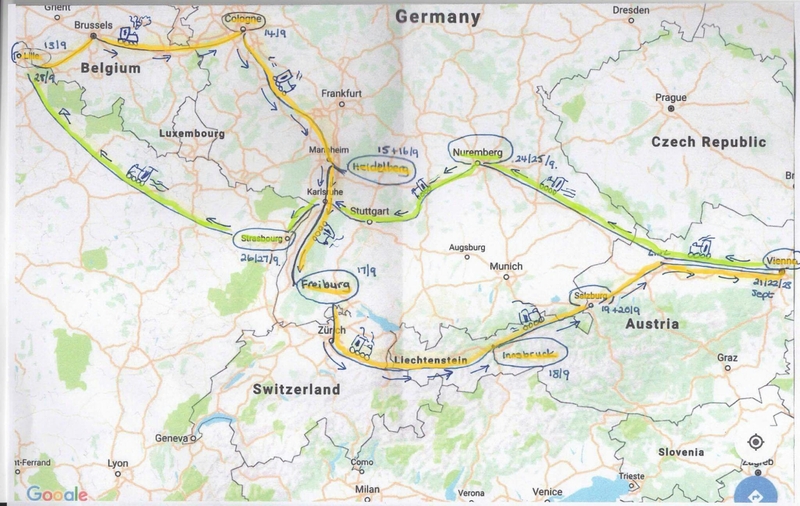 Compromise came in the form of a map of Europe and the awesome Rail Planner app produced by the Interrail people themselves: we became Virtually Adventurous. Ok – we’re at Lille station on 14th September at 9 o’clock, where are we going to go? Vienna? Seventeen hours and four changes. Too long, too many changes… There’s a train to Cologne in ten minutes… that sounds good – it’s got a cathedral, hasn’t it? Ok, it’s 15th September, 9 o’clock, we’re at Cologne station – where could we go now? Today’s one of our longest journeys: from Freiburg (well done Andy for being the first to solve yesterday’s acrostic) to Innsbruck. 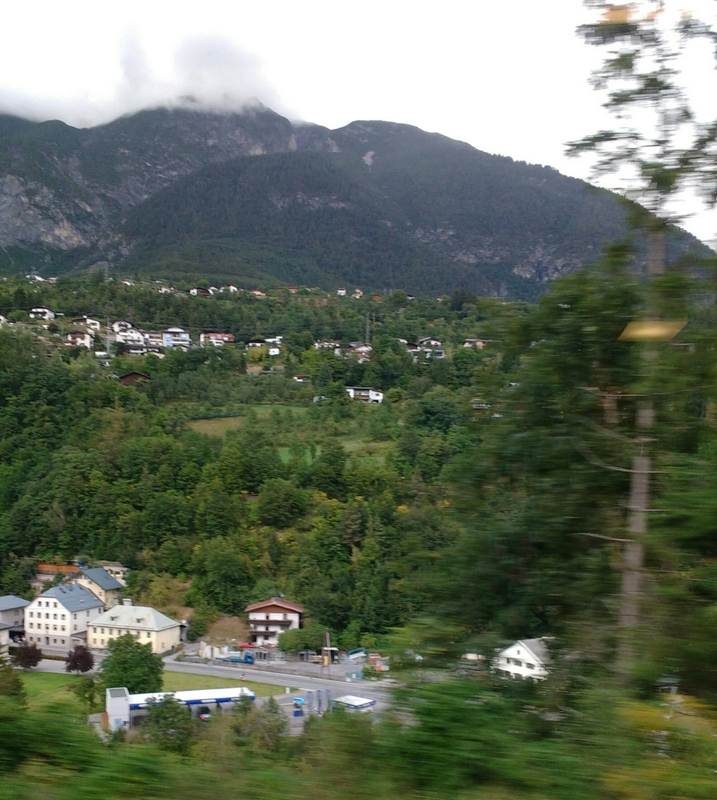 As I write this, our train is skirting the foothills of the Alps. We bagsed window seats, so I’m going to look at the scenery now in the free-spirited way of someone who knows where she’s kipping tonight. By the way, do you remember me saying, a few weeks ago, that I was offered a seat on the tube by a pregnant woman? Well, I was offered help today in lugging my suitcase down the stairs by a lady who not only looked ten years older than me (to my eyes) but had one hand in plaster and the other carrying her own bag! Good grief.